Designed with the small workgroup's business needs in mind, the Sharp FO-2080 offers an ideal balance of size and functionality. The versatile FO-2080 combines high speed faxing functionality with the conveniences of high-quality 20-ppm digital copying, network printing, and full color scanning. In addition to robust Super G3 faxing capabilities, it offers advanced faxing features such as Group Dialing, Chain Dialing, and Broadcasting. Dual paper trays enabled with Auto Tray Switching come standard along with enough standard memory for up to 50 jobs or over 100 pages. With its Offset Stacking and Duplexing capabilities, as well as feature-rich copying and printing functions that are simple and easy-to-use, the FO-2080 is engineered to keep up with today's busy workplace environments. 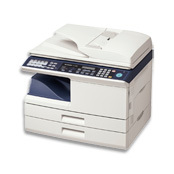 Super G3 Faxing High speed faxing capabilities help keep your business workflow moving. 20 ppm Copying and Printing Speeds Digital copy and print engine can output up to 20 pages per minute. Auto Duplexing Comes standard for Copying, Printing, and PC Scanning functions. Standard Dual Paper Trays Allow for different paper sizes or types, or added paper supply. Auto Tray Switching Automatically switches paper trays if one becomes empty while printing. Offset Stacking and E-Sort Offering convenient and time-saving finishing options. Full Color PC Scanning Easily send scanned files to multiple destinations, each with configurable file types. Data Transfer Function Send received faxes to a different fax machine for printing if needed.